Last year I participated in the Ultimate Blog Party and I met a lot of really fun new bloggers along the way. I made great connections on Facebook and Twitter and I gained some new followers. I have been looking forward to participating again this year! I definitely encourage my fellow bloggers to jump in. The Ultimate Blog Party (or #UBP12 for Twitterers) runs from April 13 - 20th. There are tons of prizes you can win along the way too. So, if you're visiting here from the party, let me tell you a little about myself. I have 3 boys - twins who are two and a five year old. We live in the Blue Ridge Mountains of Virginia, in a little log home on 72 acres. We raise chickens and have a hay crop and a large garden every year. I'm not the greatest gardener on earth, or even a halfway decent one, but I try. I am also a runner, and we try to incorporate a healthy lifestyle into our daily life. I love being eco-friendly and green where I can. I make strange creations from food in hopes of enticing my boys to try new things. And I will read just about any book I can find, except for romance, westerns, and sci fi. As you can tell, they're only slightly rotten. Even on a really bad day, these 3 are guaranteed to make you smile. I blog about parenting, rural life, and our daily outdoor adventures. I host giveaways and reviews, about once a week, for products that I myself love. If you decide to become a new follower, I'd love to follow you back, so please leave me a comment letting me know! Sounds like a great hop, Lisa. I may have to join in! Thank you and have an awesome weekend! I've never joined the blog party... maybe I should check it out. I've never done a blog party either. Thanks for introducing it. Any new followers you get would be lucky to find you. I may have to try hopping. Sounds like fun. You have the cutest little fellas. Boys are always slightly rotten, but the best thing, they always love their mama best. Lucky you. I love that we are partying together. I haven't done a blog party in so long. I'll have to check it out again. oh they are just too cute!! Best wishes with the party Lisa. Looking forward to you adding to the 1,000+ followers, who like me, enjoy your content and wisdom. 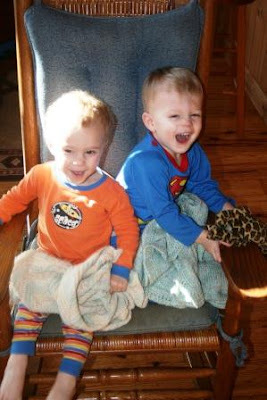 I love the picture of the twins, but Pierce just melts my heart, he is such a sweet cutie-pie!! 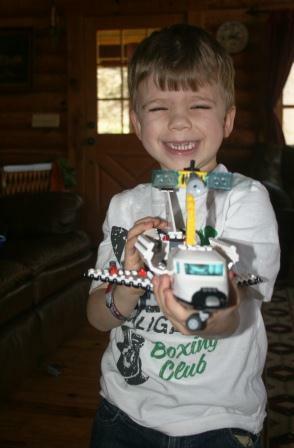 Hey, is that big smile because he made this from the new Lego set??? Sounds like fun! I've never done anything like it, but I'm pretty new to blogging. I'll look for opportunities as I go along. Your boys are so adorable! Yes, welcome to Lisa's blog - - she rocks. :) You'll find yourself sticking around whenever you come by - I know I do! Your children are adorable! My daughter has 3 boys too, so I know you have your hands full with them! I am following your blog. Do you review children's books? I'm the author of one, Animal Sound Mix-up, that young children really seem to enjoy! Thanks for sharing about your life. The Blue Ridge Mountains are beautiful. I'm not too far away, in North Carolina. I'm going to check out the blog party too! Thanks Lisa! You live in a beautiful part of the country. looks like a fun party and enjoyed reading about you and your family. Great pictures and REALLY cool plane buddy way to go !!! I hope I can get settled in time for this party. It sounds fun. Finally following you now, something I should have done long ago. Do so enjoy your posts about country life. I worked in our garden today and it felt so good to be working outside. Gotta love spring! Wow, it sounds like you keep busy!! I have just one two year old and that's enough to keep me on my toes! I'm also an avid reader and will read just about anything except westerns, sci-fi, and vampires LOL Are you on goodreads? Here from UBP. Hope you have a great weekend! Stoppin' by from UBP '12. I have only 3 acres, so, your 72 makes mine look like, well, a spec! Ha. Thanks for sharing!! I also have twins, though mine are boy/girl. I found you through the UBP 12! You are a brave lady taking the kids by yourself! Great job! !